To mark the 25th Anniversary of the Convention on the Rights of the Child on 20th November 2014, children and young people in the ACT were invited to create a self portrait and respond to the provocation of ‘why adults should listen to children’. 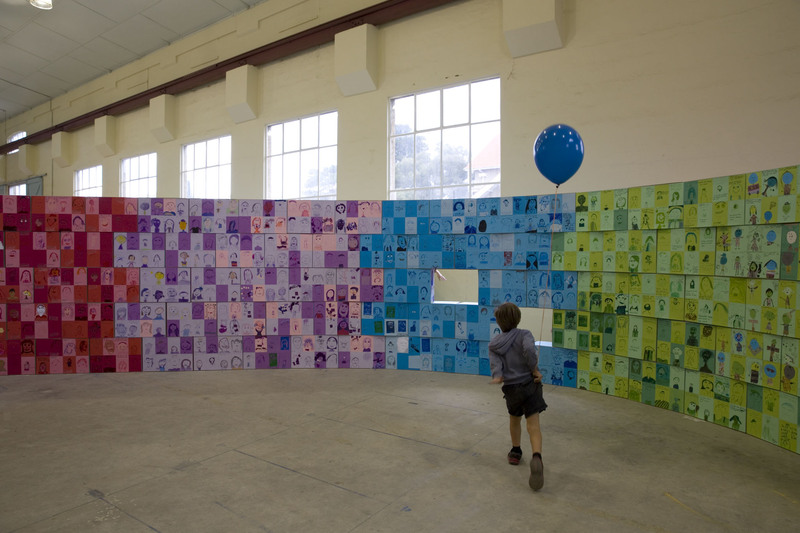 11,500 self portraits combined with texts were received from students at 50 schools across the ACT. Responding to the concept of each child and young person being a unique individual we designed a double helix form, the shape of human DNA, constructed from hundreds of recyclable cardboard boxes. The installation was designed to be environmentally friendly and easy for young people to construct out of 600 boxes and sticky tape. The project was launched during Youth Week in April 2015 by Children and Young People’s Commissioner Alasdair Roy. Project partners included Children & Young People Commissioner’s office of the ACT Human Rights Commission, the Children and Young people of Canberra, Directorate of Education and Training, architect Mark Bruce. Sponsored by Visy.